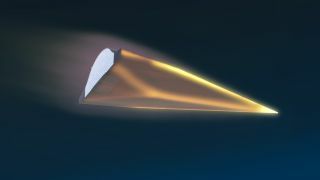 An artist's illustration of DARPA's Hypersonic Test Vehicle-2 flying at speeds of Mach 20. The Pentagon will continue to invest in space capabilities even as it pares down its force structure in response to massive budget pressures, U.S. Defense Secretary Leon Panetta said Jan. 5. "As we reduce the overall defense budget, we will protect and in some cases increase our investments in special operations forces, in new technologies like [Intelligence, Surveillance and Reconnaissance] and unmanned systems, in space," Panetta said during a press conference at the Pentagon. Panetta appeared with U.S. President Barack Obama and Army Gen. Martin E. Dempsey, chairman of the Joint Chiefs of Staff, to unveil a new strategy under which the nation will rely on a smaller, leaner force structure. The Defense Strategic Guidance was developed as the U.S.-led wars in Iraq and Afghanistan wind down and in response to the Budget Control Act of 2011, which calls for nearly $500 billion in reductions to Pentagon spending over the next 10 years. The defense budget had grown at "an extraordinary pace" after 2001, Obama said during the press conference. Being able to effectively operate in space was listed among the Defense Department's priorities in the strategy. The document says modern armed forces cannot conduct quick and effective operations without communications networks enabled in part by space capabilities. But the document also cited the increasing vulnerability of U.S. space systems. "Today space systems and their supporting infrastructure face a range of threats that may degrade, disrupt, or destroy assets," the document says. Panetta said final decisions on the Pentagon's 2013 budget request are in progress and details will be released in coming weeks.